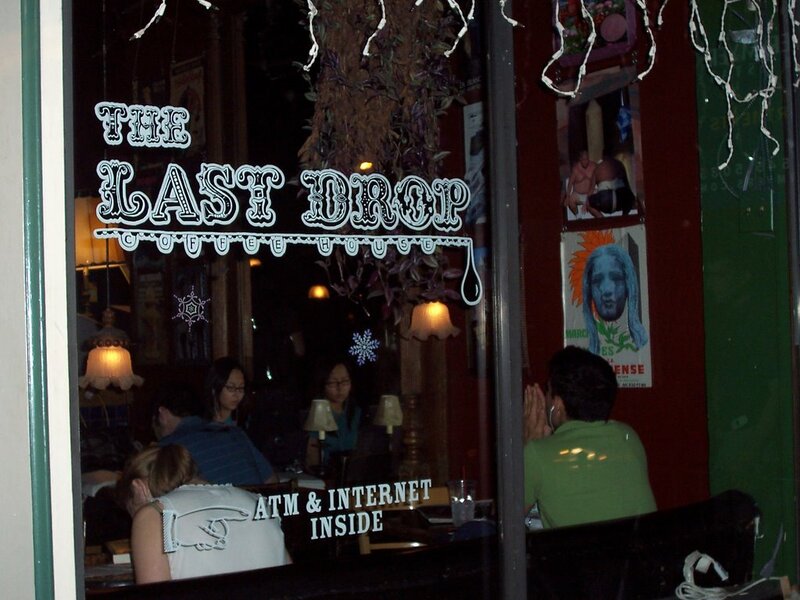 A relic of my youth, this coffeehouse has been one of the few coffee spots in Philly that I've been to avidly. 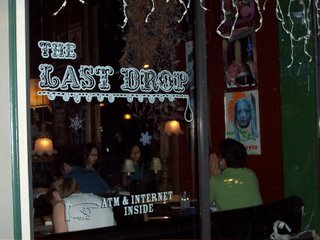 I was first introduced to the Last Drop about five years ago by a friend who's uncle has some employatic tie (which worked out since the first time we went there, my friend and I happened to meet up with his uncle, who got us both free drinks). The place was very eclectic and hasn't changed much since. Today the place is constantly packed; seems the place draws a very young, artsy crowd (being right near the Art schools on Broad St, it's no real surprise). The environment is efficient, sometimes smoky (due to tobacco-dependent patrons), usually blaring with music, and has an "interesting" basement hangout, which five years ago looked a little demonic, but fortunately has improved in decor and happy tones over the years. The coffee and espresso are La Colombe, with a very basic list of menu offerings. The tea, well I couldn't find out what kind they had since last time I asked, the barista didn't know (which is kinda sad). Overall, their coffee and espresso are consistent; nothing amazing, but pretty good. I don't know about the tea (and I'm reluctant from my last experience...), nor could I tell you bout the chai. The selling point of this place is it's always open late, like 11pm or midnight. I've only actually sat to drink me coffee there once (it's always smoky and loud, so not my top place to sit) but it's a great place to chill if you like that kind of thing. They even have outside seating in warm weather. Personally, I usually grab my java to go. The Drop has apparently not been a smoke-full environment for two years now; my mistake. Enjoy it smoke-free. Thanks for the comment. You can get La Colombe almost anyplace in the city, so I think it's safe to say that no one is visiting Last Drop just for the coffee. Thanks again! "sometimes smoky"? This place has been smoke-free for quite some time now. Unless of course you're sitting outside. Also, don't forget about the now free Wifi! :-P. Also did you know Mike is going into the Navy soon. Anyway I didnt know you were such a fan or The Drop. Its good to know.